Chaser is one of the new brands we offer here at The Boy’s Store. Chaser is a Los Angeles based clothing line that likes to take inspiration from incredible people, cultures, events, and imagery of past generations. We love their shirts because they feature amazing icons like the late great David Bowie. Their clothes are also very comfortable and lounge-worthy. Your boys will love the laid-back feel and the fun and hip images and style. 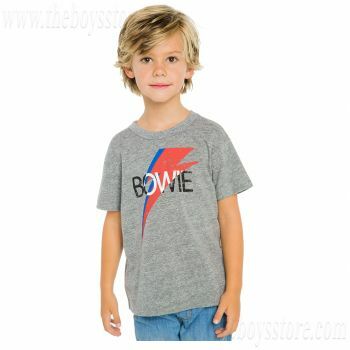 Boys Bowie Bolt Shirt by Chaser: this short-sleeved grey tee features the legendary David Bowie. His music was amazing, and his style unique. Now your boys can share that unique style and maybe just a little of the confidence and rockability. Boys Desert Cacti Lounge Pants by Chaser: These fun lounge pants feature a comfortable elastic waistband and are adorned with fun desert cacti imagery. They are soft, comfortable, and perfect for cooler weather this fall. They are comfortable to sleep in or hang out at home in. Also, they can be worn to school for that laid-back “I don’t care” vibe while still bringing in some style! 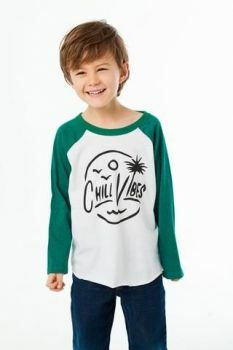 Boys Chill Vibes Raglan Tee by Chaser: This raglan tee with green sleeves and chill vibes imagery sends the perfect message in a chaotic world. Don’t kill the chill vibes man, be kind, and the world will be kind back. Chaser is one of our favorite new featured brands here at The Boy’s Store. Chaser offers fun, hip, and cheeky items that will be sure to impress. Check out some of their fun tees and tanks for spring and summer. Some of them are so cool you will hope you can wear the same size shirt as your son so you can borrow them! Boys Bowie shirt by Chaser: this shirt is like a Lazarus for fashion. Bowie may be gone, but his music, and his style lives on. This shirt is perfect for he little Bowie fan. Or the child of a Bowie fan. It will bring a little bit of the Starman into our daily lives. Boys Sunday Funday Muscle Tee by Chaser: This fun shirt will make you wish it was Sunday everyday. Its bold and relaxing all at the same time, just like our favorite day of the week. 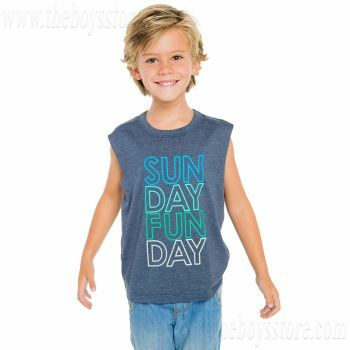 Its fun saying is cheeky and bold, its colors calm and relaxing like Sunday, and its sleeveless muscle baring sleeves make it perfect for cutting out and having fun! Boys Epic Lil Bro Shirt by Chaser: Being the little brother can sometimes be daunting. Everyone already has an expectation of you. But that doesn’t mean you have to live up to them. Break barriers. Stand out. Be yourself. Be epic! This shirt is just the beginning, lookout world, this little brother is here to surprise us all! 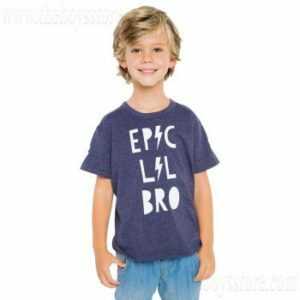 This entry was posted in boys clothing, Brand News and tagged Bowie, boys clothes, boys muscle tees, boys style, boys tees, Chaser, spring style, summer style, tees, the boys store on March 4, 2018 by Lacy.